Major transitions are often seasons of frustration, difficulty and loss. The in-between times when we've lost the old thing and haven't yet moved into the new are difficult to navigate. How do you coach a leader through a major transition? 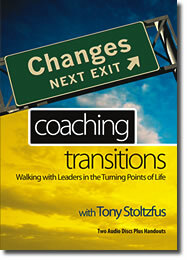 This audio coach training series from master trainer Tony Stoltzfus (originally released as a two-CD set) demonstrates transformational coaching techniques for helping coachees engage God's purposes for their growth in major life transitions. (And it will help YOU navigate your own transitions as well!) Starting with the idea that in transitions God births in you the character needed to reach your destiny, Tony shows how to connect times of suffering and difficulty to God's purposes, with several powerful Christian coaching tools based on Romans 8:28. This CD set provides teaching on understanding transitions, plus advanced Christian coach training for aspiring or practicing coaches.